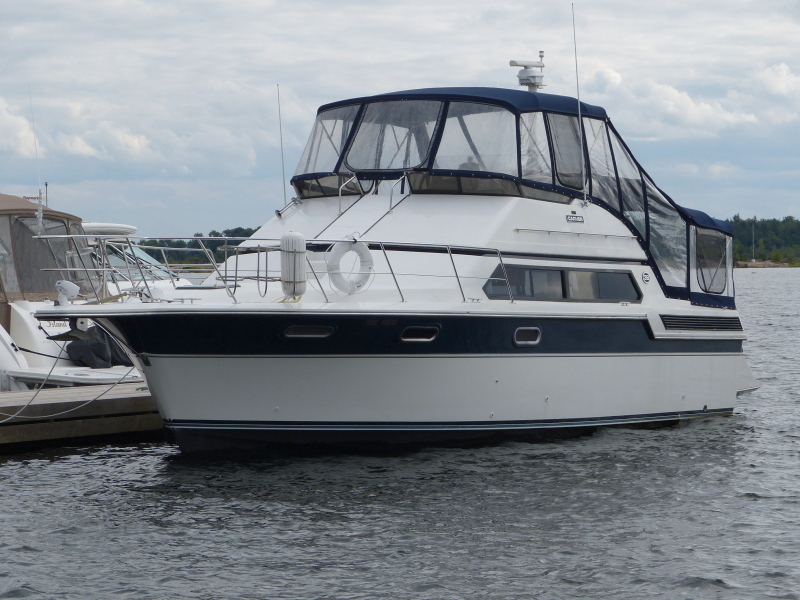 The Carver 38 Santego, also known as the 3867 Santego, is a wonderful boat for entertaining with a huge party-time layout on the flybridge and an enormous, condo-like interior. A large cockpit provides access to the bridge from port and starboard ladders, and there is an excellent molded step entrance to the foredeck from the flybridge. Below decks, the 38 Santego boasts a huge one-level cabin with a fully appointed galley overlooking the salon. The galley is equipped with a new full- size fridge/freezer and a 3 burner stove with oven, and includes a stylish bar counter for quick snacks and light meals. The starboard settee and dinette convert to a double berth, and the port settee conceals a single sofa bed. The master stateroom has an island bed, hanging lockers, ample storage cupboards and convenient stateroom access to the head. The generous head compartment has plenty of space, storage, a separate shower stall and a vacu-flush head.